Growing a B2B company is all about getting in front of great prospects and increasing RFQs. 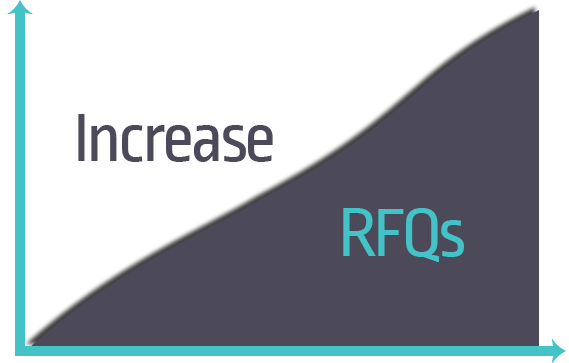 If you want your RFQ stream to look like the graph above, your B2B inbound marketing strategy needs to follow these rules. Inbound marketing knows that today's buyers are a different, more educated breed. They block your calls, filter your emails, resist giving you their card at trade shows, and generally avoid you like the plague until they're ready to pull the trigger. Inbound is about being there when your prospect is looking for you. On their terms. You do yourself no favors by interrupting them with cold calls and spam. It's about being helpful from the beginning. Assist them from their first symptom to their final purchase decision. It's more in tune with how every buyer buys today. I bet that, despite your investment into these programs, your company has not seen an increase in RFQs. That's because individual tactics like SEO or Twitter aren't enough to convert prospects into leads. You need to get EVERYTHING in the same boat, rowing the same direction. They aren't meant to function in a silo. Rather, they should support one another to win more RFQs. Let's use a ficticous company, ABC Company, to demonstrate how various B2B inbound marketing tactics can increase RFQs. ABC Company knows that their buyer personas have three to four common problems. One of those problems is they don't have an engineer in-house who knows what plastics can do for their new products. Focusing on their biggest growth opportunity, solar panel companies, ABC Company starts researching. Who at a solar company would look for ABC's solutions? Once the researcher is identified, ABC develops a complete buyer persona. They map out the persona's buying journey to fully understand their thought process, and what they need at each stage to progress. With a clear persona and journey developed, they brainstorm content. They ask, "what could help this persona at each stage of their journey?" This content will include multiple formats - blog posts, infographics, videos, and longer form premium content (like eBooks and webinars). Based on their persona and journey research, ABC Company decides to produce an eBook titled "The 10 Best Uses For Plastics In Solar Panel Mounts." This ebook will be available on their website as a download. The prospect will have to provide their name and email address to get it, thus generating a lead. The lead's contact details are automatically saved to ABC Company's CRM. But, how will these prospects find the eBook in the first place? ABC's research shows that this persona uses Google and LinkedIN heavily in their vendor research process. In the spirit of Being Where The Prospect Is Looking, a true inbound fundamental, ABC writes several blog posts on the topic of the eBook. They place a call-to-action at the bottom of each post that leads the reader to a landing page. Once they fill out a form on the landing page, they can access the eBook. Blog posts rank well in Google (SEO) and also make great LinkedIN posts. Each blog post should be promoted in social channels to take advantage of networking reach. After the prospect fills out the form on the landing page, they immediately recieve an email. Not just any email - this email is personalized for their context. It comes from an actual person at ABC Company that asks if they have any feedback or questions. This happens automatically (yay marketing automation) so ABC's staff doesn't have to remember to follow up. Over the next two weeks, the prospect will get follow-up emails from the same person. The emails contain related content offers and support. Again, the use of marketing automation software means that ABC staff don't have to remember to do anything. It just happens. Welcome to the 21st century. Each email follow up is personalized to the lead's area of interest. In this case, that's the use of plastics in solar panel mounts. The follow-up emails will also link to related content with the goal of moving them towards an RFQ. This example clearly highlights how various web tactics work together to increase RFQs. Individually, they're not nearly as effective. The goal: being there when your prospect first starts their buyer journey. You want to build trust and rapport from the outset of their buying process. The educational content you produce allows you to convert prospects earlier in their buyer's journey. This means you get to nurture them as they move down the sales funnel - you become the angel on their shoulder. When they trust you, they're much more likely to make an RFQ. Want A True Story of Inbound Success? Although I used a ficticious company above, the results are very real! Click below to see a full case study of McHone Industries' success with Inbound Marketing. Related: PPC vs SEO: Which is Better for Increasing RFQs?